Ever get the sneaking suspicion that American telecom companies are ripping off their subscriberbases? 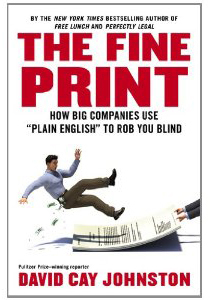 So did David Cay Johnston, author of a new book titled The Fine Print: How Big Companies Use “Plain English” to Rob You Blind. The Pulitzer prize–winning reporter uncovered some tidbits that should really rankle the phone, cable and Internet-using population in the U.S.: Apparently, compared to the rest of the western world, “we the people” are getting the short end of the stick, paying a lot more for worse service. When it comes to triple-play packages (phone, cable, broadband), France comes in at an average of $38 monthly, versus $160 in the U.S. For the money, French subscribers have free calling worldwide, live global television and faster Internet connections (10 times faster, down, and 20 times faster, up). The U.S. was once the fastest in Internet speeds (because, duh, it was invented here). Now? Of the worldwide rankings, we’re number 29th on the list and dropping. In fact, America is getting trounced by countries like Bulgaria. The Japanese are voracious tech users, but maybe that’s because they’re not getting gouged — Internet data fees in America are 38 times that of Japan. Were things actually better back when Ma Bell was an evil monopoly? Well, at least phone service was cheaper. Now the cost has increased (even when adjusted for inflation) and includes fewer services. The government’s disbanding of the monopolistic empire was intended to offer more choices to consumers and create a competitive market. But things didn’t go according to plan — unless the plan was for phone and cable companies to pressure Washington, lobbying for changes that benefitted their businesses and shafted customers. That plan went like clockwork. And now, instead of a monopoly, we have the equivalent of a duopoly, says Johnston, with AT&T and Verizon controlling over 60 percent of the marketplace. As for Internet access — fiber optics was supposed to be the wave of the future. While other countries forge ahead, investing in infrastructure, we’ve got services like Verizon FiOS — which has limited access and no presence at all in many geographic areas. You’d think Verizon would be working like crazy to expand on its fiber optic network, but history doesn’t seem to bear this out. Verizon announced in 2008 that it would stop building out its FiOS (fiber-optic system) once it reaches about 16 million of America’s 100 million households…. Instead, it has made deals with Comcast to sell its services using Comcast cables. Verizon said it anticipates similar deals with other cable providers to sell of their systems. This is a pretty dismal-looking state of affairs. Americans are paying more and getting less, and for what? Just to make tons of money for domestic telcos? The very same ones who are making a fortune by robbing the U.S.’s technological future? If Johnston’s facts hold true, then a federal inquiry should be a no-brainer. This is nothing short of “Information Super-highway” robbery, and it will inevitably stunt the growth of the U.S. tech sector like nothing else.